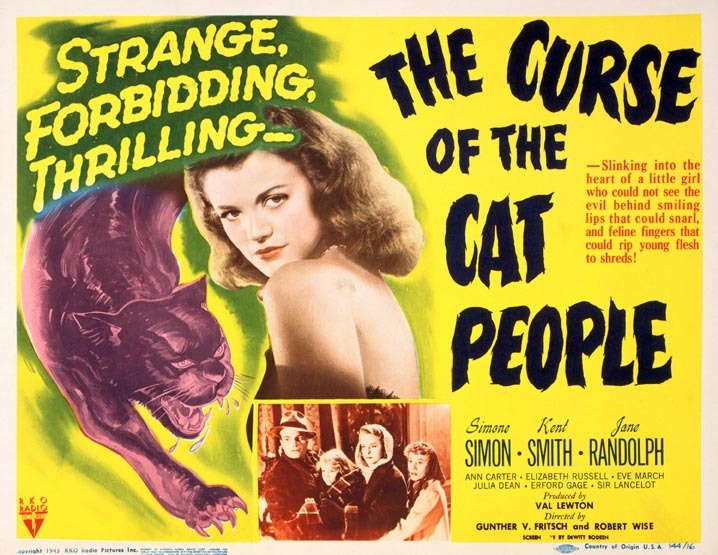 The Curse of the Cat People is the sequel of The Cat People, both produced for RKO by Val Lewton. This film is directed by Gunther von Fritsch (as Gunther V. Fritsch) and Robert Wise. This is Wise’s first film and of course went on to direct some great films noir as well as a few classic musicals and throw in some sci-fi and horror favorites. Our three main characters are the same as the first film and we throw in a creepy little girl for an added twist. This film was released in 1944, two years after the first film. Over this two years, our happy couple at the end of the first film has married and has a 7 to 8-year-old daughter named Amy, played by Ann Carter. If this time frame doesn’t make sense, well I think your right. Not only do we have a little girl 6 years older than possible, her father played by Kent Smith, thinks she has a little of her deceased first wife in her, someone who has died a year or so before she was born. Well who said a good film has to make total sense, especially a horror noir. As the film goes on Amy is alienated from the other kids more and more, but she finds a new friend in the ghost of Irene, her fathers first wife, played by Simone Simon, who has died in the first film. Things continue to get creeper and creeper from here. 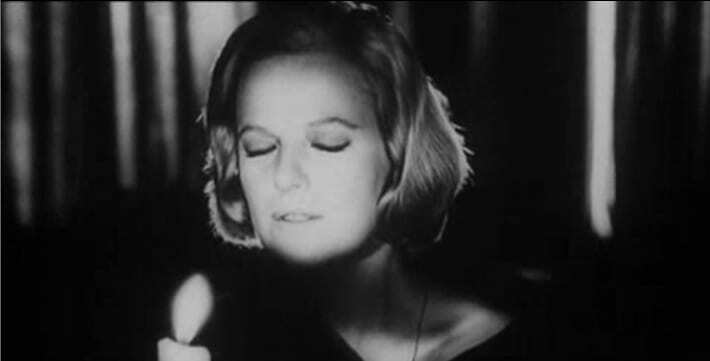 Seance on a Wet Afternoon is a British Noir from 1964, written for the screen and directed by Bryan Forbes. The film is based on a book by Mark McShane. This film stars Richard Attenborough and Kim Stanley. Stanley was widely considered one of the best actresses of her time. You may not know of her or seen much of her work because she didn’t do many films. She much more preferred working live theater then working in the movie industry. She also did sporadic television work through out her career. She did love this script when she read it, but the reason she did this film is because of director Forbes’ involvement. Though she never gave any names, she once stated that if Forbes could make that dead fish look good, he could make anybody look good. Though she was only in a handful of movies in her 30 plus year career, she was nominated twice for an Academy Award for best actress, not a bad percentage. This film was one of those nominated efforts. This film tells a story of a down and out couple, Myra and Billy. Myra is a psychic and Billy is sickly and out of work. Myra gets the idea to kidnap a rich couples’ young daughter and then have Myra “use her psychic abilities” to help find the child. This would make her séance business boom from the publicity. She talks Billy into doing all the leg work for the job, though he is very reluctant. The couple gets deeper and deeper into their own scheme as Myra continues to change the plan and outside forces continue to alter it. Will the couple get away with kidnapping or worse? Though Stanley’s acting in this film is excellent, let us not forget about Attenborough’s performance. I actually enjoyed his performance better. His Billy is a man trapped in a marriage he can not get out of, for more than one reason. Does he do what Myra says because he has no other choice or is Myra his femme fatale who can use her charms to get him to do what she wants? This film is worth a viewing just for these two performances. Are our main characters crazy or trapped…or maybe both? Oh, Happy Day! Ben Affleck has started shooting Live By Night today! If you haven’t read the book by Dennis Lehane I recommend you do. Here is a shot Affleck posted to his Tweeted earlier today. The Suicide Theory is an Australian neo-noir from director Dru Brown and writer Michael Kospiah. This film revolves around our two main characters played by Steve Mouzakis and Leon Cain. Mouzakis plays Steven Ray, a hired hit-man who is afraid to cross the street and tends to cross dress in the privacy of his apartment. 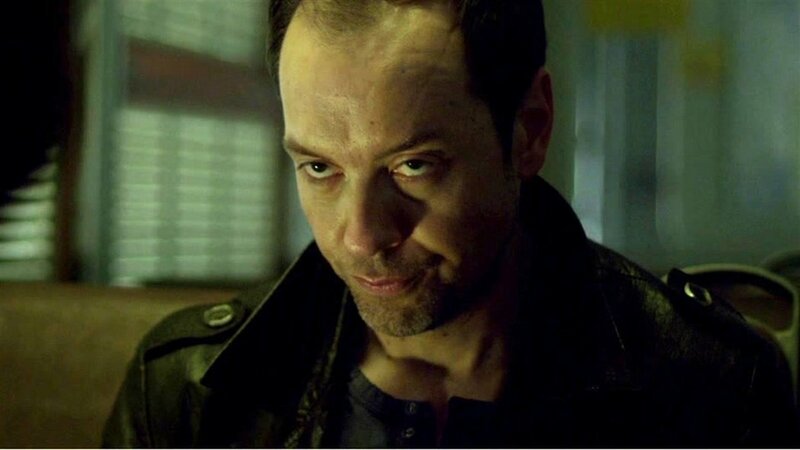 Cain plays Percival, an artist who wants to die, but cannot seem to get the job done on his own. This films opening scene starts with Ray going to the store to pick up some ice cream. He talks to the store clerk about just finding out he is soon becoming a father. When they are interrupted by a rude customer, Ray jumps the customer in the alley and pummels him with the frozen ice cream. We flash forward three years and Percival hires Ray to kill him, because after numerous attempts he has failed to kill himself. The two soon grow a close bond with each other. Coincidence and fate are discussed between the two throughout the film and is the driving force of this story. This film has a few flashbacks that come unannounced, making it a little hard to follow at first, but if you stick with it the puzzle comes together for you. This is an interesting concept and worth viewing for neo-noir fans looking for something new to watch. 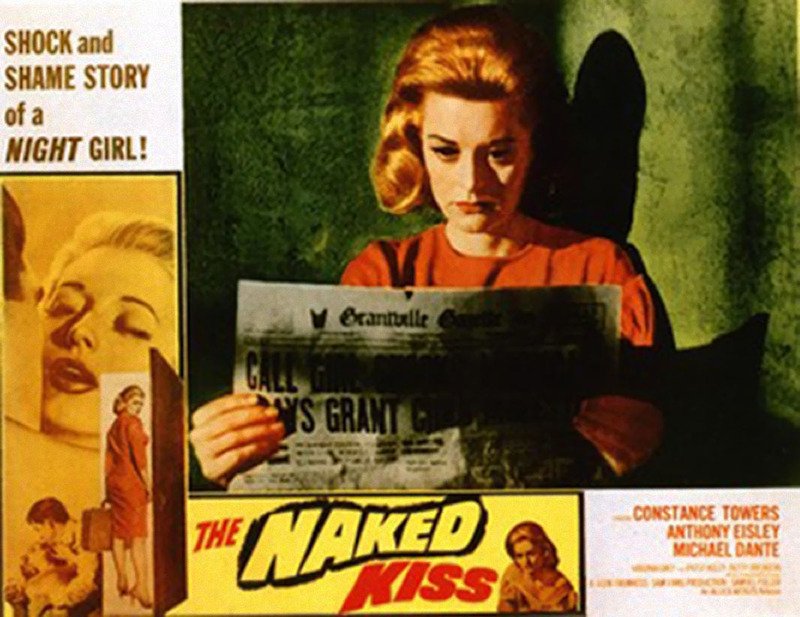 This Naked Kiss is a film noir from the noir legend Samuel Fuller. Fuller wrote and directed this film from 1964. This film starts out with a prostitute named Kelly, played by Constance Towers, in a fight with a man. The man pulls off her wig to reveal she is completely bald! The reason she is bald in this opening scene does come up later in the film, but seems a minor point by that time. This is a shocking scene though and appears promptly on many of the posters and promotional items for the film, I’m sure it peaked some interest in the film and sold a few tickets back in 1964. After this battle with the man, Kelly takes only the money that is owed to her and leaves. The film then flashes forward a few years as Kelly gets off the bus in Grantville. She soon meets a police captain named Griff, played by Anthony Eisley. Griff soon becomes Kelly’s first customer in town and it is also her last. Griff recommends Kelly go across the river and work at an established cat house in the neighboring town. When Griff goes to the cat house to see how Kelly has settled in, he finds she is not there. Kelly has had a change of heart and soon gets a job at the local hospital for children. When Kelly meets J.L. Grant, the Grant for which the town Grantville is named, there are instant sparks and a romance soon starts. The holes in this plot are so big that the plot doesn’t even make any sense after a while. Why does a prostitute suddenly decide to change her ways? OK, this one may be explained away as perhaps Kelly was playing the long game and using her femme fatale ways to land the most eligible bachelor. Kelly does seem to come across as bi-polar, one minute she is the nicest person you will ever meet and the next she is loosing it for some minor reason. I don’t know whether Towers is a bad actress or brilliant, I could never get a read on what Kelly’s motives are and at the end of this film I still didn’t know why she did half the stuff she did. This film is unique and a bit campy in places, but well worth viewing for fans of classic film noir. This is not my favorite film from Fuller, but he has made it interesting enough that I’m glad I did see it. Favorite Tidbit: Samuel Fuller put a few Easter Eggs in this film from his own noir universe. In one scene you can see Kelly walking by a theater where Fuller’s previous film Shock Corridor is on the marquee. In another scene Kelly is reading on a park bench while talking to Griff, the book she is reading is The Dark Page,a book written by Fuller.